Each year, the School of Film welcomes in a select few undergraduate members of the Honors Tutorial College. These outstanding students enroll in graduate-level classes along with the MFA students and participate in film crew service, and eventually write and direct their own films. Students in the HTC program receive BFA degrees at the end of their four year term. Evan grew up in Cincinnati, where he was homeschooled from 3rd grade onward. The “school for homeschoolers” he attended during this decade, Leaves of Learning, is where he became interested in filmmaking. In 8th grade, he wrote his first feature film. Over the next 4½ years, he and a group of friends completed a trilogy of superhero sci-fantasy features, aided by a supportive network of parents and teachers, and premiered these films in movie theaters. In 2017, Evan attended the NHSI Film & Video program at Northwestern University- a transformative experience in his development as a filmmaker. Evan’s love of filmmaking is centered around the idea of building immersive visual worlds that aid in storytelling. Among his core interests is production design- he has made dozens of costumes, props, and set pieces for his films. Perhaps unsurprisingly, he has been influenced significantly by the Lord of the Rings trilogy (both the films and the books!). 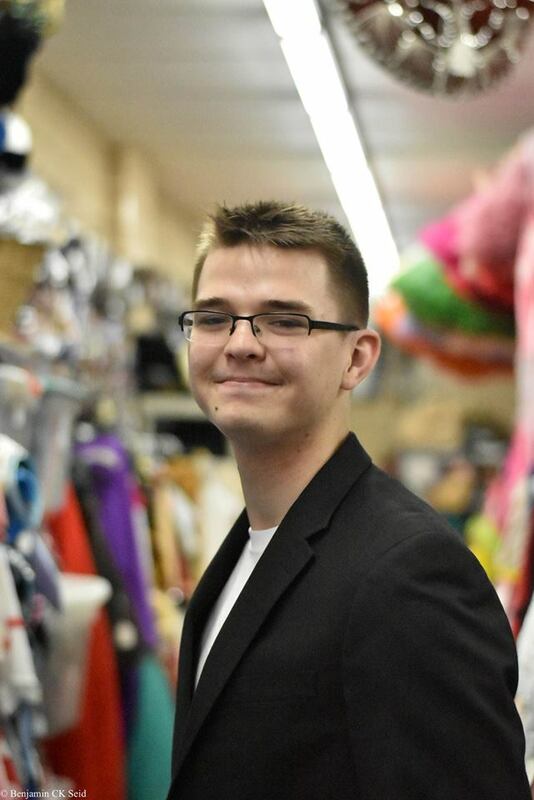 Evan hopes to develop himself as a filmmaker, a production designer, and an educated human while at Ohio University through the Honors Tutorial College, School of Film, and Cutler Scholars programs. Emily Isaacs was born and raised in the (unwelcome) heat of Charlotte, North Carolina. From an early age, Emily showed signs of having a vast imagination. The pursuit of creativity has always been encouraged in her household. As such, Emily’s mother had to endure one crazy story after another from her daughter. At the age of thirteen, Emily discovered that films and moviemaking could be a great source for her to tell her fantastical stories. Having always been drawn to the intricate weaving and storytelling of films, she took every chance she got to explore the media. Now, Emily listens to movie soundtracks by Hans Zimmer and James Newton Howard as a means of inspiration as she writes her stories. Her favorite films are the 2003 Peter Pan and the Pirates of the Caribbean series. (Don’t ask her about Peter Pan unless you have three hours to spare.) Emily hopes her time at Ohio University will give her the means and experience to be that much closer to achieving her dreams. Alex Keller was born in Cincinnati but moved around the state throughout his childhood. He spent a large amount of it in Springboro before eventually going to High School in Loveland. Making films, no matter how bad or stupid, was something he did with his friends all the time which eventually blossomed into a strong passion. Around freshman year he began to take it much more seriously and has been pursuing various artistic endeavors ever since. His first serious short film is called “Tick”. He LOVES talking about films so just tell him to shut up if he goes on about them for too long. His favorite directors include: Steven Soderbergh, Stanley Kubrick, Paul Thomas Anderson and David Lynch. Juliana grew up in Rocky River, Ohio, a city on the westside of Cleveland. In high school, Juliana played volleyball and performed in the school’s musicals and plays. Her passion for theater found her in attendance at an acting for the camera camp in the summer of 2016 at Interlochen Center for The Arts. There, she saw what it was like to be in front of the camera, but was also intrigued by the action behind the camera. Her experience at the camp inspired her to write her own stories and pursue a career in film. Juliana spent her freshman year of college at Sarah Lawrence where she studied film production and urban ecology. She transferred to Ohio University’s School of Film excited to join the community. While at OU, Juliana hopes to further explore her interests in writing and directing. Nic Walli was born in Columbus, Ohio into a house with a great appreciation for film. His father, having grown to love the subject while in college, instilled in Nic the value of the medium. For as long as Nic can remember, film has been his dream occupation. Spanning genre and movements from German Expressionism to Spaghetti Westerns, Nic can't wait to further his film knowledge in the Ohio University program. Bailey Plumley was raised (but not technically born) in Bucyrus, Ohio. Beginning with the work of Christopher Nolan at the age of 11, Bailey fell in love with film and decided to pursue a career as a filmmaker. By 14, he had sold all his Legos in order to buy his first camera. He attended a summer college program at Syracuse University in the summer of 2016, where he worked on his first films, and later created a music video featuring copious amounts of blue lipstick. Bailey’s favorite films are often honest social dramas, and his favorite filmmakers include Xavier Dolan and Paul Thomas Anderson. Most of Bailey’s own ideas are humanist in nature, honestly exploring sexuality and everyday human connections. He has a passion for music and wants to continue making music videos. He hopes his time at Ohio University will enrich his understanding of film and make his dreams of writing, directing, and acting all the more attainable. Max Williams was raised in Oakwood, Ohio, a small, two square mile town outside of Dayton. While in high school he partook in plays and musicals run by the drama department. He also ran cross country and track, and swam on the school team. Through a two year career technical program, Max has worked on film crews for several student productions, and has even ran a camera for several football and basketball games. He hopes to continue down this path, improve upon his abilities, and someday work as a director of photography. Logan grew up in Lebanon, Ohio, a small town located just north of Cincinnati. In 2016 he graduated at the top of his class from Lebanon High School, where he discovered his passion for filmmaking and founded the school's first-ever film club. During his time here at Ohio University, Logan will be working towards honing his craft in the realms of both editing and directing. Some of his biggest film-related influences include directors Alfred Hitchcock, Stanley Kubrick, and Paul Thomas Anderson. Blaize was born in Westerville, Ohio and grew up in nearby Lewis Center, where he attended Olentangy Orange High School. Throughout high school, Blaize was an active participant in the International Thespian Society, drama club, ski club, and is still an ambassador for Lifeline of Ohio. Blaize received his first camera in elementary school, which fostered his new passion for photography. It wasn't until high school until he decided to study filmmaking. Some of his interests as far as filmmaking include Stanley Kubrick, psychological thrillers/horrors, and of course, Harry Potter. Ben is from Evanston, Illinois, where he graduated from Evanston Township High School, where he worked on short films and documentary. He’s currently a sophomore in the Honors Tutorial College here at Ohio University. Some of his inspirations when it comes to filmmaking have been Stanley Kubrick, David Lynch, Werner Herzog, etc. He loves storytelling as a craft, and is most often compelled to tell stories centered around the conflict between the nature of the individual and how that contributes to a societal whole. Savannah was born and raised in North Canton, Ohio, where she explored a wide variety of interests including soccer, ballet, sketching, and reading. She was first introduced to filmmaking during her freshman year at the Montessori High School at University Circle and continued to explore it throughout the following years. Currently, Savannah is a sophomore at the Honors Tutorial College at Ohio University. She loves the visual beauty of film and is looking to create entertaining, innovative and informative films about topics that she is passionate about. Patrick Local was born and raised in Waverly, Ohio. In 2014, he graduated valedictorian from his high school. Now, as an undergraduate student pursuing his BFA in Film through Ohio University’s Honors Tutorial College, Patrick is currently interested in the relationship between body and mental illness and is exploring that topic through experimental shorts.